Much is written about Tesla (TSLA) and Elon Musk on this platform and elsewhere. The circus that surrounds Tesla is well-known and heavily-covered on this platform – so I won’t write about any of that here. Instead, this is simply an attempt to forecast Q4/18 vehicle deliveries based on the best available data. Overall, I estimate that Tesla will deliver ~91,085 vehicles – up 9% from last quarter, including over 61,000 Model 3s. This estimate implies that Tesla will meet their 2018 target for 100,000 Model S and X delivered with a bit of breathing room to spare. Given analyst revenue estimates of ~3.5% sequential growth, Tesla will need to keep ASPs from slipping more than 4.5% to meet those top-line targets, assuming my estimates are close and assuming the Tesla’s non-automobile units are flat sequentially. Tesla has raised prices several times over the last few months, which should help prevent too much price erosion on their vehicles, although this will be offset by the introduction of the $46,000 Model 3 MR. In my view, Tesla has a good chance of beating its Model S/X delivery target and a reasonable chance of beating analysts’ top-line estimates. I will continue to hold my Tesla shares. Each of the estimates herein is based primarily on three pieces of data. 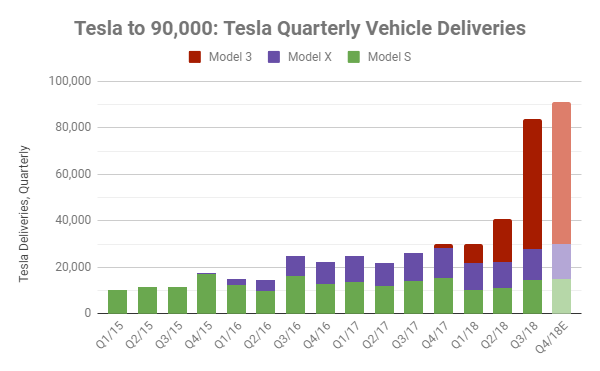 Each estimate is based on Tesla’s actual delivery information from past quarters. This data is available in Tesla’s quarterly update letters delivered on earnings day. Tesla also provides estimates of this data in an 8-K filing within a day or two of the end of a quarter. This data provides Tesla’s actual deliveries but is only available quarterly – unlike many manufacturers which provide similar data every month. Estimates are also based on monthly estimates for Tesla’s American sales from Inside EVs Monthly Plug-in EV Sales Scorecard. Inside EVs only includes sales in the United States but is updated each month, usually within a few days of the end of the month. Estimates are further based on European vehicle registration date from Tesla Motors Club. A post on TMC’s forum contains European sales data from each European country, with data updated as it becomes available. This data is a bit incomplete for the most recent month, as shown above: Spanish Model S registration results are not yet available. Here, the “Model S Registrations, Europe” is data from Tesla Motors Club, by quarter. 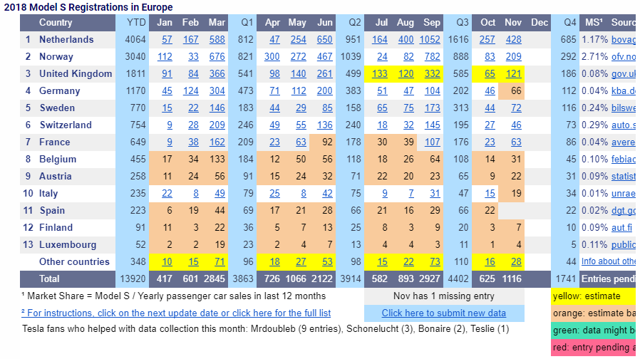 “Model S Sales, United States” is data from Inside EVs, also organized by quarter. Total Model S Sales is simply the addition of those two lines and Tesla Deliveries refers to Tesla’s published total Model S deliveries in a given quarter. Most of this data comes from 8-Ks, as Tesla doesn’t usually break down S vs. X deliveries in its quarterly update letters. As shown, over the past year, sales in Europe and the United States have made up ~85% of sales of Model S vehicles over the past year, with the remainder of sales primarily occurring in APAC and Canada. As shown, Tesla has had six months where they sold more than 10,000 Model S and X vehicles combined: 9/16, 12/16, 3/17, 9/17, 12/17, 3/18, and 9/18. All of those months are the third month of a fiscal quarter. Indeed, since the start of 2015, Tesla has always delivered the most vehicles in the third month of the quarter. Thus, simply multiplying the first two-month results by 1.5x will yield inaccurate delivery estimates: Those estimates would have been too low in each of the past 15 quarters. To remedy this problem, the above chart includes only the first two months of European registrations and Inside EVs sales estimates from every quarter. For example, last quarter, Insides EVs showed Tesla having Model S sales of 1,200 in July, 2,625 in August, and 3,750 in September. Thus, the above chart shows 3,825 (1,200 + 2,625) Model S vehicles sold in the United States in Q3/18 – excluding the 3,750 reported September sales. The Tesla deliveries above are actual deliveries for the quarter, and the percentage of sales is sales in the first two months divided by total sales. As shown, last quarter, U.S. and European sales in the first two months of the quarter accounted for 37% of total Model S deliveries in Q3/18. For Q4/18, I estimate that Tesla will deliver ~14,907 Model S vehicles. This is based on assuming that reported deliveries in the first two months will be 39% of total quarterly deliveries – the average percentage of the last two quarters. Averaging the last two quarters here is conservative compared to using the 37% metric from Q3/18, which would yield an estimate closer to 16,000 Model S deliveries. Last quarter, Tesla delivered 13,190 Model X vehicles. Thus far in Q4/18, Tesla has delivered 5,683 vehicles, although data from Tesla Motors Club is again missing Spain for November. That is a very minor exclusion though, given that Spain is averaging 15.9 Model X registrations/month. Given the level of error inherent in these estimates, the absence of this data is trivial. 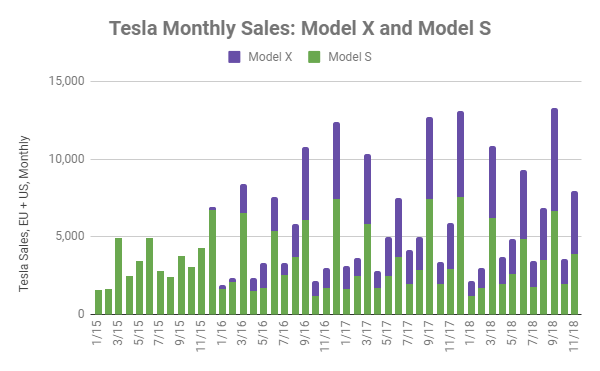 We will again take the first two months’ data rather than full-quarter sales data to form estimates: Sales of the Model X show a lot of seasonal variability as in the chart above. Last quarter, first two-month sales in the United States and Europe represented 38% of total Model X deliveries. If we estimate that the same percentage of Model X deliveries occurred in those regions in those months, this suggests that Tesla may deliver ~14,923 Model X vehicles in the fourth quarter. Model S/X Deliveries 28,425 21,815 22,319 27,710 29,830? However, even with less dramatic declines than 70% it is possible – perhaps even probable – that these estimates will be too high as Tesla’s U.S. and European sales may make up a higher proportion of total sales given tariffs in China. We’ll find out in January. The Tesla Model 3 is not available in Europe. According to Autoweek, the Tesla Model 3 will roll out in Europe in February 2019 – well after the end of Q4/18. Because of that, Model 3 deliveries are based solely on data from Inside EVs. Aside from the United States, the Tesla Model 3 is only available in Canada – it is also not yet available in APAC. Thus, American sales represent the vast majority of Tesla Model 3 deliveries. Last quarter, for example, Inside EVs reported Model 3 sales equal to 97% of total Model 3 deliveries. Sales of the Model 3 have not been going on long enough to draw as strong of conclusions as for the Model S and X. Sales appear to show some monthly seasonality: Last-month-of-quarter sales were the highest in four of the five quarters that the Model 3 has been offered. However, in Q2/18, Model 3 sales were higher in the second month of the quarter (May 2018) than in the final month of the quarter (June 2018). As shown, over the past four quarters, first two-month sales have made up an increasing proportion of total sales – from 31% in Q4/17 up to 57% in Q3/18. As the quarters pass, Tesla’s monthly Model 3 sales are becoming flatter and flatter, with respect to in-quarter seasonality. 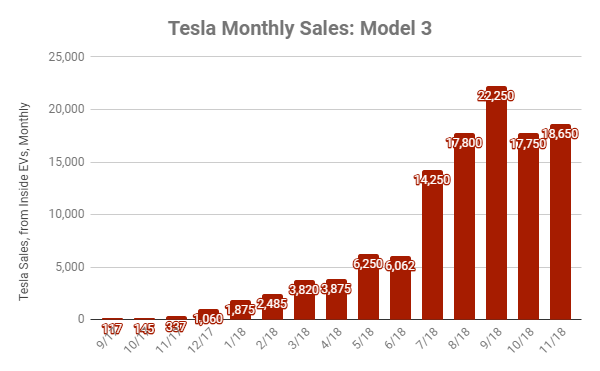 Because of flattening monthly variations, I will estimate the first two-month sales make up 59% of total Model 3 sales – continuing the 53%, 55%, 57% trend of increase by 2 pp each quarter. Thus, I estimate that Tesla will deliver ~61,255 Model 3 vehicles in the fourth quarter of 2018. In total, my estimates would result in 91,085 Tesla deliveries in Q4/18. This would be a record for the company. This estimate implies ~9% sequential growth in automobile deliveries. Given 9% sequential growth in deliveries, Tesla should break their own record for the most automotive revenue in a quarter, set last quarter at $6.1 billion. Given the relatively small size of Tesla’s other segments, Tesla would also be very likely to beat their Q3/18 revenue as well. Last quarter, Tesla earned $6.82 billion in revenue. Analysts at Yahoo Finance expect Tesla to generate $7.06 billion in revenue next quarter, up 3.5% from Q3/18. If automobile sales rise 9% in Q4/18, that may be an achievable target: Tesla would need to prevent automobile ASP from falling more than ~4.5% to beat this revenue target, assuming they ship 91,085 automobiles and assuming that non-automotive segment revenue is flat from Q4/18. The primary driver for falling ASPs in Q4/18 will be the introduction of the less-costly Model 3 mid-range. Depending on product mix, this $46,000 vehicle could reduce average sales prices substantially, although that decline may be offset by waves of price increases on Tesla vehicles, beginning in the middle of last quarter. Given those price increases, Tesla may have a good shot at beating top-line revenue estimates. We will find out in ~early February. Access to my Model Cannabis Portfolio and my current portfolio.